You have to give them credit for adjusting to the times, though. It took a while, but the Top of Waikiki gradually phased out its tired interior decor and added contemporary touches. After going through a few chefs, they’ve had Lance Kosaka at the helm for a few years now, revamping the menu to suit both local and visitor tastes, and giving flair to the hip Sky Waikiki upstairs. Here we are, 50 years later, and they’re celebrating with a menu that features many old favorites, spruced up like a round of botox to keep them looking youthful and fun. Here’s a look at some of the items we tried that are featured on the anniversary menu, which you can order anytime. And honestly, we enjoyed them all, especially because they were great for sharing. 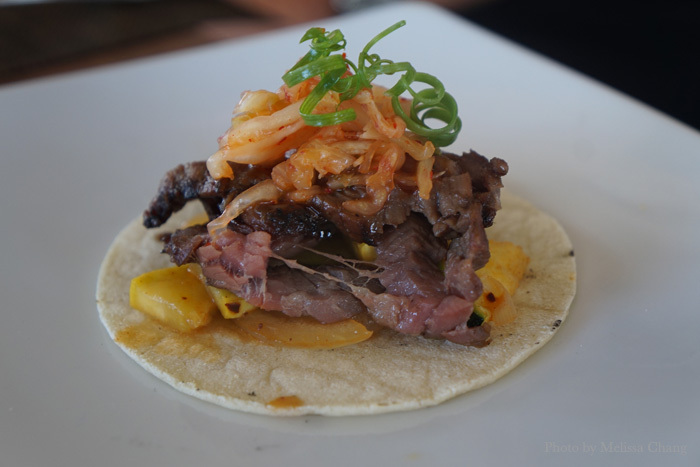 Korean tacos, $10 at happy hour. You get a plate of these food truck-inspired street tacos filled with tender kalbi marinated beef, Korean vegetables and kim chee. Foie gras brioche, $16. 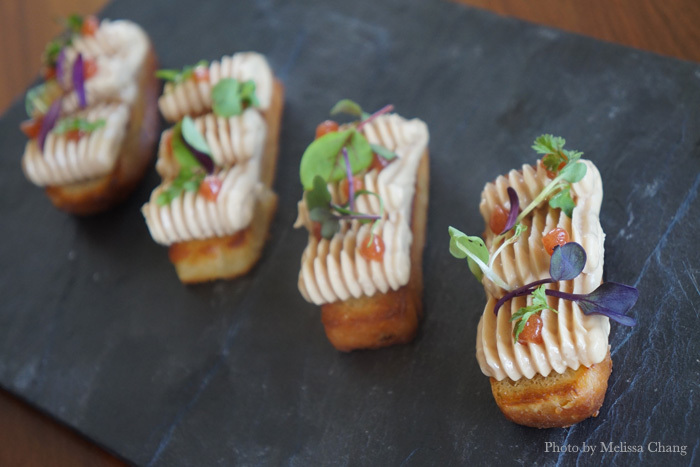 I’d go back just for a plate of this, house-made brioche topped with foie mousse and guava jelly (not ikura!). Pretty damn delightful. Porchetta, $28. This Filipino-inspired, slow-roasted porchetta has that gorgeous, crunchy skin all the way around so you get it in every bite. 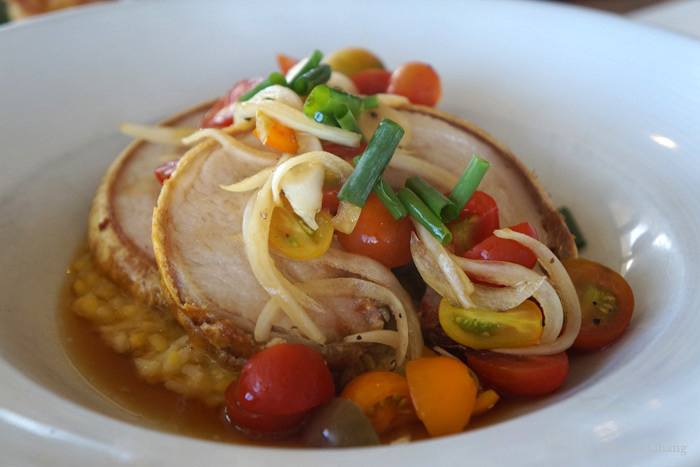 The pork sits on a mung bean risotto, and has a tomato and onion relish. This isn’t your mom’s lechon! 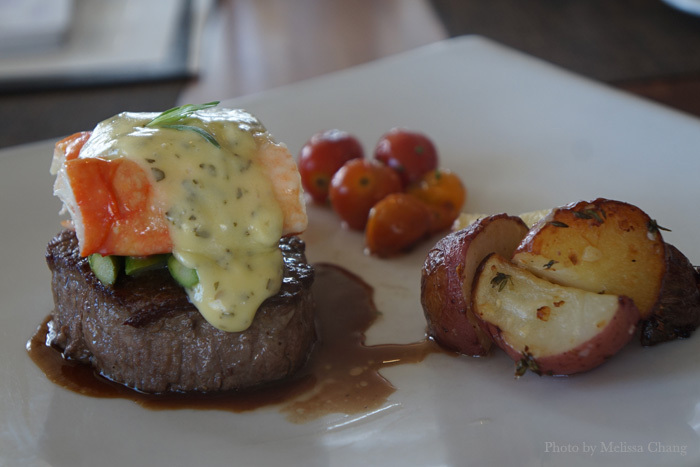 Filet Oscar, $65. For a splurgy treat, get this pan-roasted beef tenderloin with butter-poached king crab legs, asparagus, and roasted red potatoes. It’s topped with veal jus and sauce Bernaise for added decadence. 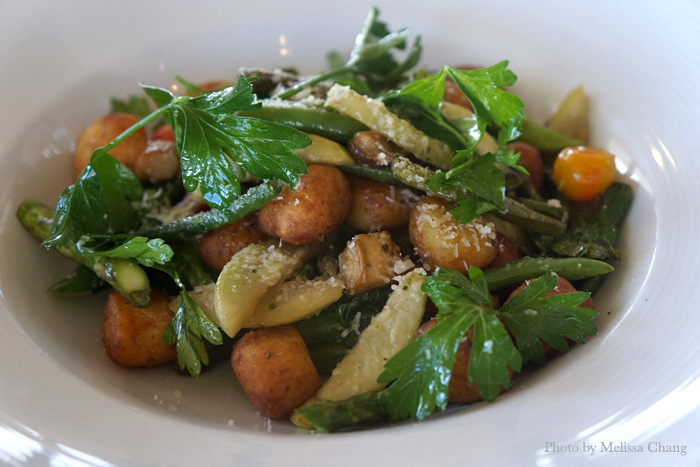 House made gnocchi with farm-fresh vegetables, $27. Lovely potato pillows tossed with market veggies and finished with green garlic butter and parmesan cheese — perfect for vegetarians. Pineapple shave ice, $9. Since it’s still super hot, each of us wanted to dunk our faces in this bowl. 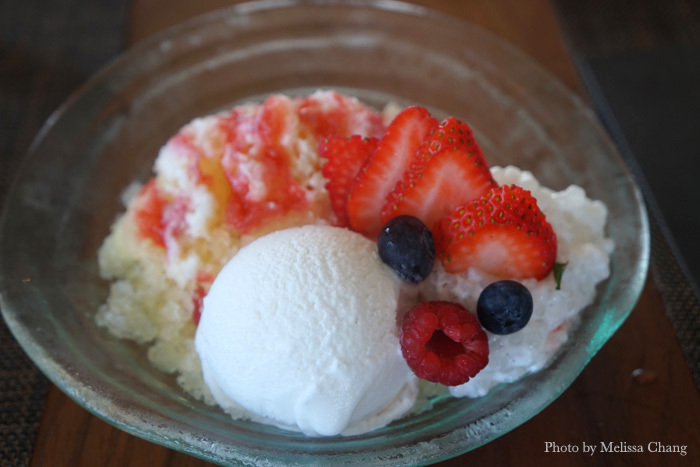 Pineapple shave ice with coconut sorbet, vanilla bean tapioca, strawberry syrup and sweetened condensed milk is a nice, light way to end a meal. Haupia eclair, $9. 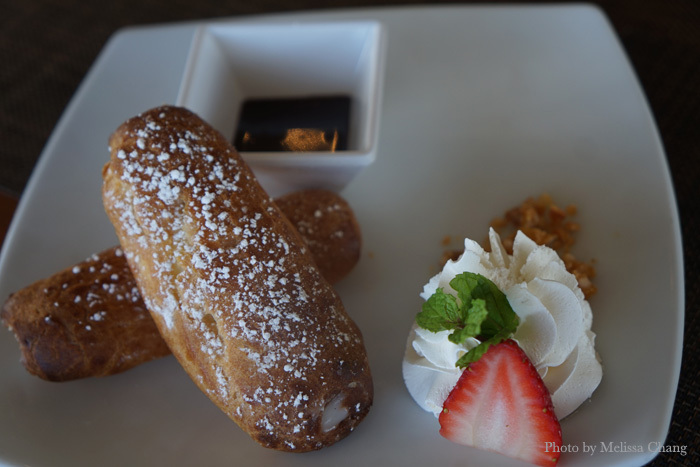 Pastry chef Heather Bryan took her haupia cream puffs and made them better, then listened to her customers — who all want more chocolate — and put a bowl of chocolate on the side for dipping. You can take it a step further with the candied macadamia nuts. House made doughnuts with lilikoi curd, $10. Who needs Krispy Kreme? Heather Bryan made her own with fried yeast doughnuts, then filled them with lilikoi curd and topped them with chocolate (seen here with an accidental sprinkle overload). 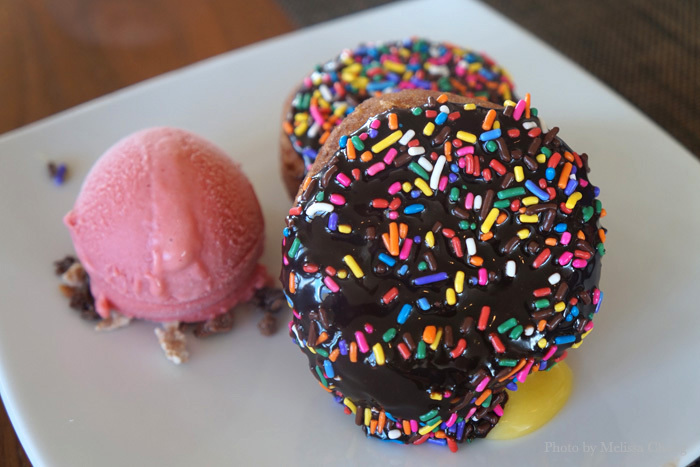 Served with strawberry ice cream.